When we were recently sent some Amp’d Mobile Noise Cancelling Headphones (XQS-109) to review by an American retailer called wirelessground.com, I was initially intrigued to test them out. Why? You may ask, well it appears to me that every electronics company under the sun has their own offering so I was interested to know how the smaller manufacturers fare in comparison. So you may have heard that first impressions are everything, even in the world of unboxing headphones. In this instance, it would be correct to believe so as removing them from their transparent packaging and even beforehand whilst peeking through, I was feeling completely and utterly uninspired. The entirely black model is aesthetically rather bland with no contrast and a mildly glossy plastic, which ultimately feels cheap and unworthy of their recommended $79.95 retail price. The headband whilst even slightly stretching them to put them over my head left me slightly worried as to their robustness. Being careful not to snap the plastic I plugged them into my MacBook Pro and began using them for some mild shoot ‘em up gaming. 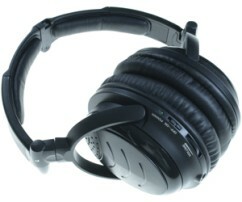 Comfort wise, whilst they are on your head they initially feel OK, much like any other on-ear headphones of the sort. However, after a prolonged period of intense tense zombie shooter gaming, the plastic covers on the earcups become increasingly awkward and almost claustrophobic. The slightest drop of sweat, which was inevitable in the recent heat-wave (if you can call it that), left them surprisingly itchy and uncomfortable. For fairly mild use such as low volume gaming or watching a quiet chick flick with minimal violence, the headphones provide sufficient sound quality to make either a mostly enjoyable experience audio-wise. Nothing overly spectacular but a good range of sound and a reasonable performance in the bass department creates overall a solid pair of headphones. Now, as they are noise cancelling headphones it was only fair to put them to the relevant test. So, as I was heading out as a passenger on a motorway road-trip, I put the headphones through their paces attempting to block out the sound of the car doing 90mph 68mph on the rough British road network. I was actually surprised by their overall performance in this area. Even with the car radio playing they made a reasonable attempt to keep it out and in the end marked a significant improvement over in-ear headphones such as the standard Apple headphones you get with any iPod or iPhone. 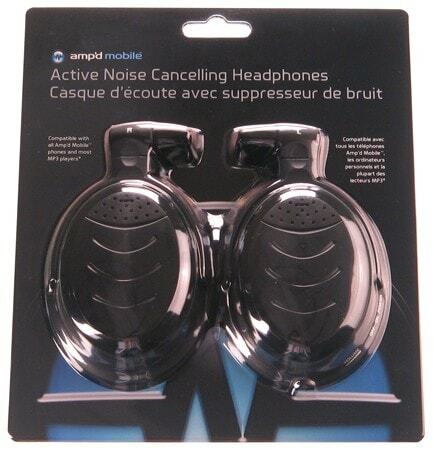 The Amp’d Noise Cancelling Headphones (XQS-109), which are admittedly cheap at their sale price of just $29.95, and are reasonable performance in terms of sound quality. However they’re just not good enough to overcome the discomfort and poor build quality which will constantly remind you that you perhaps could have spent your money more wisely.